Jose Miguel Espinar - Champion! Our tournament this weekend was solid proof that poker is growing worldwide and that Latin America, in particular, is poised for major tournament play. Fighting through three very long days and 351 skillful opponents, Jose Miguel Espinar has just captured the title here at the PokerStars.net LAPT Punta del Este! The luxurious setting here at the Mantra Resort Spa Casino provided a wonderful backdrop for a tournament. The players were comfortable and the staff took good care of them for three full days.This final stop on the LAPT offered up a prize pool of more than $850,000, and 32 players captured their own piece of that. The big chunk goes to Espinar though, who will snag $241,735 -- or a whopping 4,605,000 Uruguayan pesos! This is easily the biggest cash in Espinar's short poker career, which began just six months ago. Along the way, he faced a tough test, including a final table that was truly skilled. Despite his competition, Espinar's chip stack climbed steadily all day, and by the end of the night, he found himself on the top of the mountain. That just about wraps things up from Punta del Este Uruguay. All indications are that the LAPT will be back here next year, and we certainly hope to see you then. Until then, congratulations to our champion, Jose Miguel Espinar! On the very next hand, Alex Brenes puts the last of his 40,000 chips all in holding . With plenty of chips, Jose Miguel Espinar makes the call, tabling . Again, a massive crowd surrounds the table, eagerly awaiting the outcome of what could be the final hand. The flop is about as good as it gets for Espinar. It comes , giving him top pair and a flush draw to boot. Brenes realizes that his hopes are vanishing with just two cards left to find salvation. The turn is the , no help to Alex. Down to his last card, Brenes needs to find one of the non-club aces to stay alive. Unfortunately for him, the peels off, winning the hand and the championship for Jose Miguel Espinar. Alex Brenes put on quite a show this weekend, and in the LAPT overall. His two final table appearances are certainly worthy of high praise. He was unable to capture a title, but he will take home $127,625 tonight. Jose Miguel Espinar has the button. Finally, the spectators have the big pot they have been waiting for. The two men stand and exchange a few well-wishes as the chips are counted down. When the final numbers are in, it is Espinar who is all in and at-risk, covered by just 40,000 chips. As flash bulbs pop and cheers erupt from the crowd, the dealer burns and spreads the flop. It miraculously comes out . The nine right in the door vaults Brenes into the lead and puts Espinar on the very brink of extinction. There are still two cards to come though. The tide turns quickly once again, and it is Espinar who catches back up, pairing his kicker to retake the lead. By this point, the crowd is going absolutely ballistic, barely believing what they are witnessing. The river is the , and Jose Miguel Espinar's pair of tens are the winning hand. 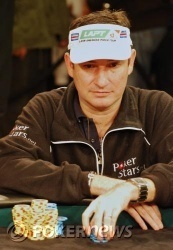 He rakes in nearly every chip in play, leaving Brenes with just 40,000 lonely checks. On the official structure sheet for this event, there are only 26 levels scheduled. The last official level was 30,000/60,000 - 5,000. After that level, it says on the sheet, "Per Tournament Director." As per the tournament director, the new level is 50,000/100,000 with an ante of 10,000, representing a huge increase over the previous level. The pace of the action should pick up -- and in fact has picked up -- considerably. The cards are back in the air, and the blinds have moved up steeply. The tournament clock has been paused while we take a 10-minute break. During the break, the white T25,000 chips are going to be put into play. Alex Brenes has the button. He raises to 180,000. Jose Miguel Espinar plays back at Brenes for the first time in a long time. He reraises to 310,000 and Brenes goes into the tank for about five minutes before folding. 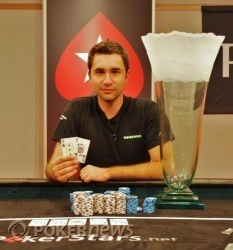 Alex Brenes has won a few recent small pots, and he has worked his way back to being dead even with his opponent. Both men currently sit with right at 1.75 million checks in front of them.